I like to check in with A Lab On Fire on a regular basis, just to see what they've been up to. This brand has won my respect over the years, not just for what they do but for what they don't do. They work with top-notch perfumers to offer unusual but wearable fragrances with quirky back-stories — some of the characteristics that originally attracted me to niche perfumery. Meanwhile, the brand maintains an opacity and reserve that are all but extinct in 2019: no interviews with photogenic creative directors (indeed, no photos of the creative director at all! ), no launch parties, no ingratiating social media presence, no peppy PR emails, no free bottles sent to "influencers." I've owned What We Do In Paris Is Secret and Rose Rebelle Respawn for a long time, and I've liked nearly all the other fragrances I've sampled from this house, even if I'm chronically lagging behind the newer releases. I recently added a sample of Hallucinogenic Pearl to an online order from Luckyscent and let it sit in a box of samples on my desk for a while. I tried it one day this week, and then I tried it again the next day. I still don't fully understand its name, visuals, or description ("a sense of genuine divinity is felt between skin tones and Venetian blonde"), but none of that matters when the fragrance itself is good enough to keep me coming back for more. A Lab on Fire classifies Hallucinogenic Pearl as a "floriental violet leather fragrance" and informs us that it was developed by perfumer Émilie Coppermann. Its notes include ambrette seed, bergamot, pink pepper, violet, Iriseine De Laire,* orris, suede, blond woods and musks. On my skin, Hallucinogenic Pearl leads with leather — a lot of it, as well as a very sharp smoke note. Singed leather? Not the kind of fragrance I typically enjoy wearing, but if I wait a bit, I'm able to enjoy Hallucinogenic Pearl's evolution into a minimalist woody floral. If its floral notes could be seen as colors, they'd be a range of grays and faded purples. The violet is dusty, not sweet; thanks to the supporting woods, the iris feels quietly warm and "matte" rather than green or metallic. 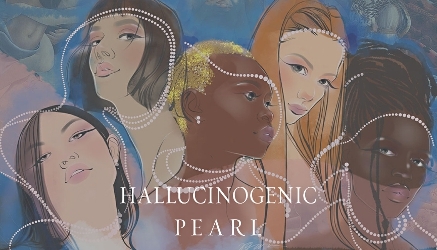 Despite being constructed around that classical iris theme, Hallucinogenic Pearl has a very contemporary sensibility. My all-time favorite iris-and-violet fragrance is Guerlain Après l'Ondée (transparent yet powdery); I'm also very fond of Frédéric Malle Iris Poudre (much denser, amber-y). Hallucinogenic Pearl doesn't feel anything like either of those. Its lightly peppery violet-iris heart does remind me of Balenciaga Paris, with less musk and patchouli; it also made me think briefly of the iris in Neela Vermeire Creations Niral, although its composition is much less spicy or baroque. Hallucinogenic Pearl has excellent longevity on my skin, lasting throughout a full workday, with moderate sillage. Once its burning-leather stage dissipates, it skews a little more feminine than masculine. I'm sure I'll finish my sample and I may add a full bottle to my wishlist. "Let the mystery unfold," reads the tagline for A Lab on Fire. Once again, they got me. A Lab On Fire Hallucinogenic Pearl is available as 60 ml Eau de Parfum ($125). For purchasing information, see the listing for A Lab on Fire under Perfume Houses. *For more information on De Laire fragrance bases, see Bases are the basis of modern perfumery... Notes on Jean Kerléo's conference at the Osmothèque at Grain de Musc. This one sounds lovely Jessica, I haven’t tried any of the Lab on Fire offerings, I will have to find out if they are carried in any London stores. This one and ‘What we do in Paris..’ sound like just my cup of tea. Robin and I don’t often overlap in our perfume tastes, but we both enjoy WWDIPIS! I find it too sweet for hot weather, but I love wearing it with sweaters and fluffy scarves in fall and winter. Knowing our shared tastes, I think you might enjoy this one! And I do love the name, even if I’m not sure what it means! Thanks for the review. This is not a brand I can get access to without going to a bit of expense, and fewer niche brands strike me as being worth the trouble these days. But I’m intrigued by this one, wondering if it belongs to the Jolie Madame genre or not? I’ve never smelled JM, but would haved loved to. Violets and leather always attract me as a romantic combination of feminine strength. Fragility and endurance, that sort of thing. So perhaps I should seek out a sample of Hallucinogenic Pearl. I like iris and non-sweet violet. Balenciaga Paris was too musky. I gave it to a friend who wears it beautifully. Hm…I sniffed an old bottle of Jolie Madame at an antique fair once but I don’t know how good its condition was! I have a feeling that JM was always bolder than this fragrance is…my impression is that JM was more leathery throughout, sometimes described as “butch,” but Hallucinogenic Pearl is kind of cool and androgynous! That sounds even better! Leather can be a little scary. Thinking about this I got out my bottle of Bottega Veneta today for the first time in ages. Lovely stuff.